This contest started on 2/1/19. This contest has a winner. 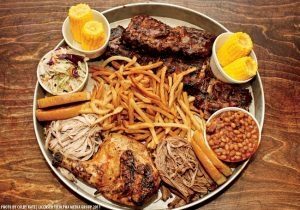 * Win A $25 Rock N Roll Ribs Gift Card. The $25 Gift Card is good at Rock N Roll Ribs, 4651 State Road 7, Coral Springs, Florida 33073, (954) 345-7429. Check menu/info at rocknrollribs.org. ***** Rock N Roll Ribs, 4651 State Road 7, Coral Springs, Florida 33073 (954) 345-7429. 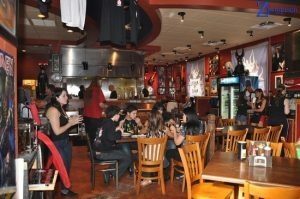 Rock N Roll Ribs is a “bbq joint”…it opened about 3 months ago…one of its co-owners is Nicko McBrain, the legendary drummer of the metal-band Iron Maiden…by the way, Nicko lives in Boca Raton. So, you now know— how “it” probably got the name Rock N Roll Ribs. The joint, has videos of bands playing, records on the wall, hanging guitars and a drum set as its decor. Rock N Roll Ribs is located in a shopping center on State Road 7…I think there are more empty stores than going businesses. Personally, I think that the spot stinks, but hey, it ain’t my dime! The joint isn’t all that big, maybe 80 seats. From what I understand, although Nicko is one of the owners and hangs out there- when he is in “town” (he wasn’t there, last night), it is run by “Moby” Rick Baum who according to the joint’s “pr” has an extensive background in developing/ opening/ running restaurants—the guy also plays guitar in Nicko’s (other band) McBrain Damage… What I can tell you, based on last night’s meal, this guy Moby Rick knows his bbq. At this stage of the concert, check www.rocknrollribs.org for menu/prices/photos. Now let’s talk food…tried- baby back ribs, bbq chicken, pork sandwich, cheese burger, french fries, garlic toast—this is some of the best bbq that I have had “down here” in South Florida. This joint’s bbq is not heavy-smokey, but rather “sweet” grilled stuff, that is right on the money. On the pricing front—very reasonable…a full rack of baby back ribs with garlic toast and 2 sides goes for $15.95…a 1/2 chicken with garlic toast and 2 sides $12.95. On the service side—very pleasant and efficient waitstaff. Like I said before, 80 seats, looks better than a Hard Rock Cafe, real good food, real good prices, real good service, lousy location. Hey! Nicko and Rick, you got a great concept here…I just hope that people “find” you. One final thought, you might like to check www.ironmaiden.com and www.myspace.com/mcbraindamge and read about Nicko and Rick’s music and bandmates. Just so you know, Nicko-is considered by many, to be one of the top rock drummers of all-time. I really enjoyed Rock N Roll Ribs. The joint is open 7-days a week 11am-10pm. I love this joint. Its food is terrific. Outrageously delicious bbq. Been eating there for years. Would love to win. I love this place, amazing food, great staff!! Never tried it … right down the street. Would give it a go. I love the baby back ribs there. It’s about 4 miles from my house and I’ve never been. Winning would get me there for sure. Who doesn’t love a rack of ribs? I’m going to have to trying this place even if I don’t win. Some of my friends were there when Nicko was in the house. They chatted for a while and said he’s a real good guy.